In celebrating the holy month of Ramadan, we are pleased to invite you to join us May 26, 2018, for our annual Iftar dinner. We would like to take advantage of the special blessings of Ramadan to thank you for your continued support and encouragement of the Coalition and the Abdi Family. 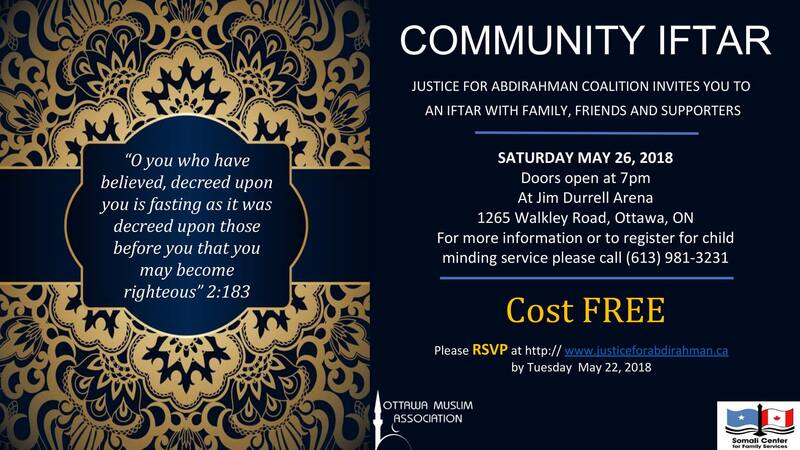 Despite the devastating circumstances that led to the creation of the Justice for Abdirahman Coalition, we have seen this community rise up and speak out for injustice. Without of the sustained support from our community, we would not have had the success we have seen in the last year. Abdirahman Abdi’s death was not in vain. He would be honoured and proud to see his community come together like this. Please join us for a delicious four course dinner buffet to celebrate some key success and hear what we have on the go!